We are growing a new kind of classroom. It’s made entirely from willow donated by Abbotsbury Swannery, and the classroom, shaped like a large igloo complete with tree trunk seats, will help our children learn more about nature. 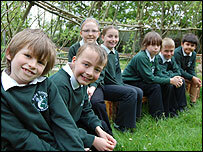 Click to find out all about planting a willow classroom. Click here to check out a special feature all about it on the BBC website.